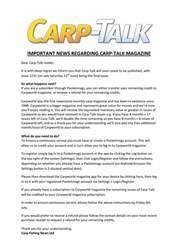 This week’s issue of Carp-Talk (issue 1011) is available to download now! 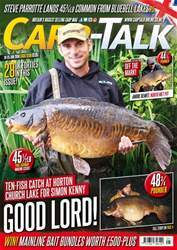 Big-carp catches have gone through the roof this week, with two fifties and an abundance of forties present in this extra 16-page issue. 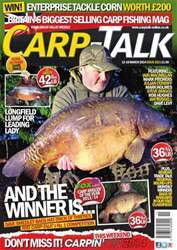 Adrian Fautley looks back at a successful winter’s carping, and Mark Holmes presents the first part of his ‘Carp Fishing without a Rod’ mini-series. 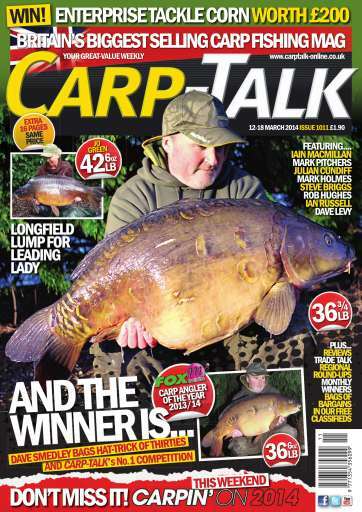 We have got news of the latest inductees to the Carp Fishing Hall of Fame, Mark Pitchers talks solid bags, and products from Venture, Avid, Wychwood, Cygnet, Fox, Taska and Korda go under the spotlight. Ian Russell reveals his ‘Go-Anywhere Rig’, Neil Spooner talks ‘Irre-Fuza-ble Hookbaits’, and Dave Levy, Steve Briggs, Lewis Read, Julian Cundiff, Adam Garland, Rob Hughes and Tim Childs are in the ‘Hot Seat’. 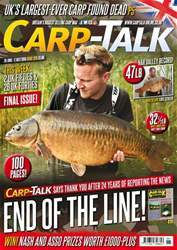 James Anthony puts a new enhancer through its paces, Iain Macmillan looks back at how accuracy improved his particle fishing, and Calum Kletta visits two productive winter waters. Not only that, we have got Tails Up monthly winners, and £200 of Enterprise Large Corn to give away.